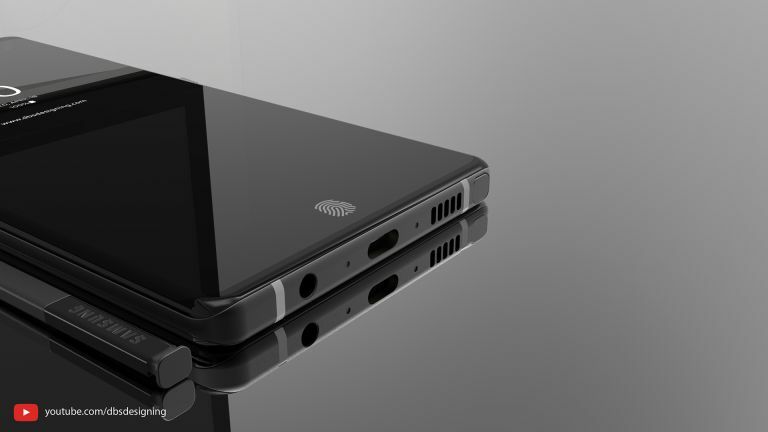 As the release date for the Samsung Galaxy Note 9 slowly approaches, the internet is turning its attention to what this phone will look like. Yesterday, we saw our first supposed leaked images of the new Note, but these were quickly shown to be fake by SamMobile. And now we have some rather lovely renders of a concept Samsung Galaxy Note 9, created by Muhsin M. Belaal Auckburaully of DBS Designing. The concept shows a sleek looking handset with curved edges as we have on the Samsung S9 and S9+, a pair of tiny top and bottom bezels, and NO NOTCH. There’s an in-display fingerprint reader (which we’re expecting in either the Note 9 or the Samsung Galaxy S10) with an on-screen prompt showing the user where to place their fingertip to unlock the device. On the back of the phone, there’s a pair of vertically aligned cameras along with the flash and heart rate monitor next to them. And then there’s a selection of S-Pen styluses in a variety of colours to match the handsets. Feast your eyes on the full video below.